2017-18 Panini NHL Sticker Collection continues the tradition of bringing collectors of all ages a fun and affordable product. 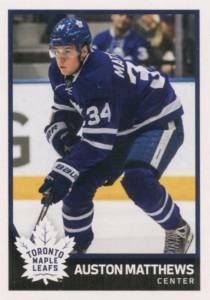 The low-cost set offers various sticker options with players from every National Hockey League team, as well as revisiting several league events. 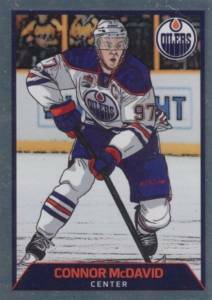 The 2017-18 Panini NHL Sticker Collection checklist maintains the format of the previous releases, focusing on top veterans and rookies, as well as incoming players via the 2017 National Hockey League Draft. However, the '17-18 set also provides the first sticker options for fans of the Vegas Golden Knights, the NHL's newest expansion team. As expected, over 100 glossy foil stickers help enhance the hefty lineup, which totals just over 500 sticker cards. The corresponding 2017-18 Panini NHL Sticker Collection album provides adequate storage to display the set with full-color pages for each team. The 72-page album also contains room for key moments from the previous year. Additional events covered include the 2016-17 NHL Awards, 2017 All-Star Game, 2017 Stanley Cup Playoffs, and 2017 Stanley Cup Final. 509 stickers. Shop complete base sets on eBay.